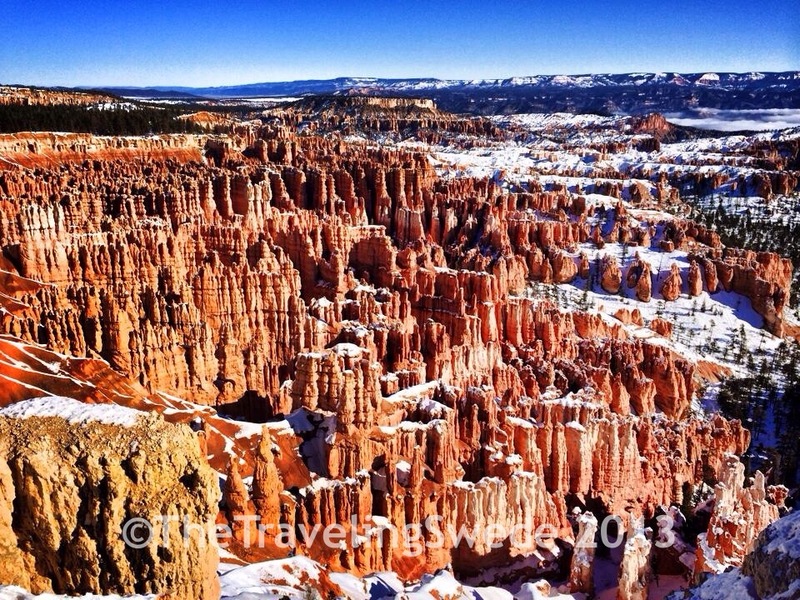 After my stop at Death Valley National Park & Valley of Fire State Park my road trip continued to Bryce Canyon National Park in Utah. Bryce Canyon is about 4 hours southeast of Salt Lake City or if you are visiting Las Vegas, NV about 4 hours northeast of there. 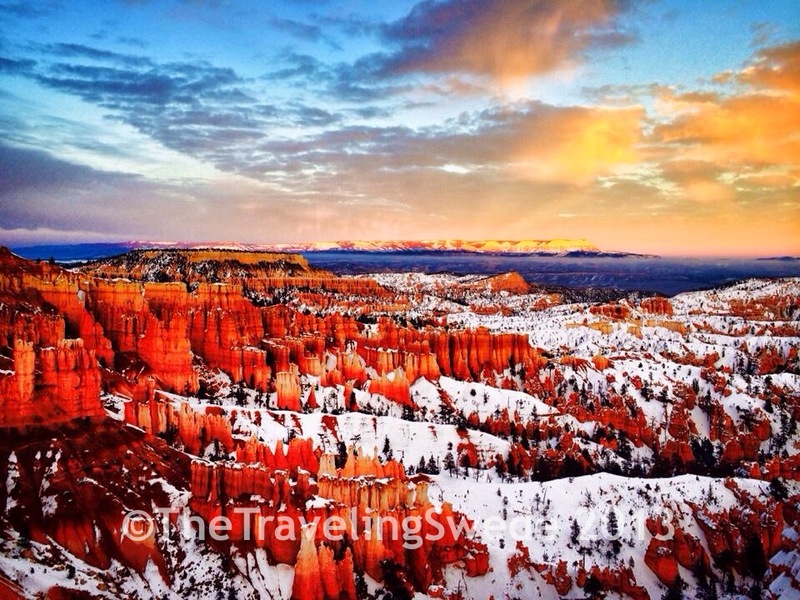 I have been to Bryce Canyon National Park before but I was extra excited as I had never been there during the winter. I arrived about an hour before sunset. 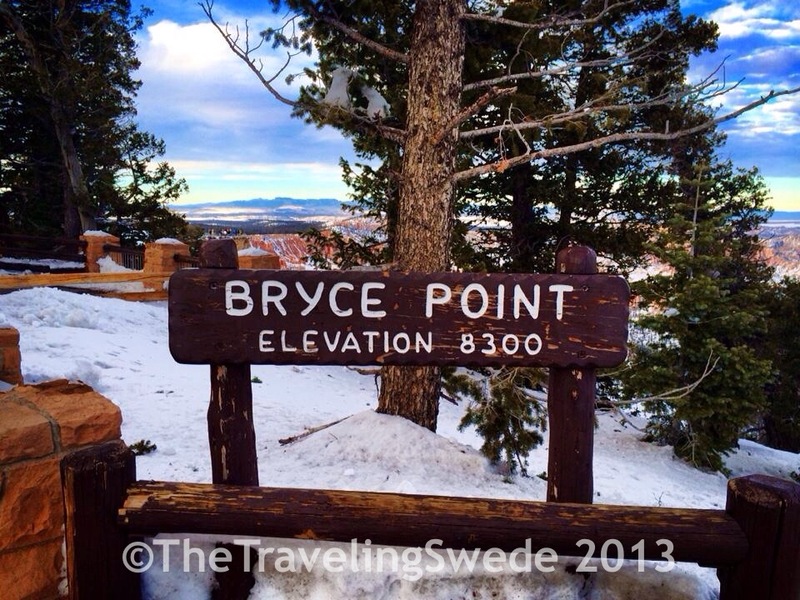 I quickly drove to Bryce Point which is a nice area to view sunsets and a popular point as you literally walk out on a narrow point. If you look in the background you can see people standing out at the point. 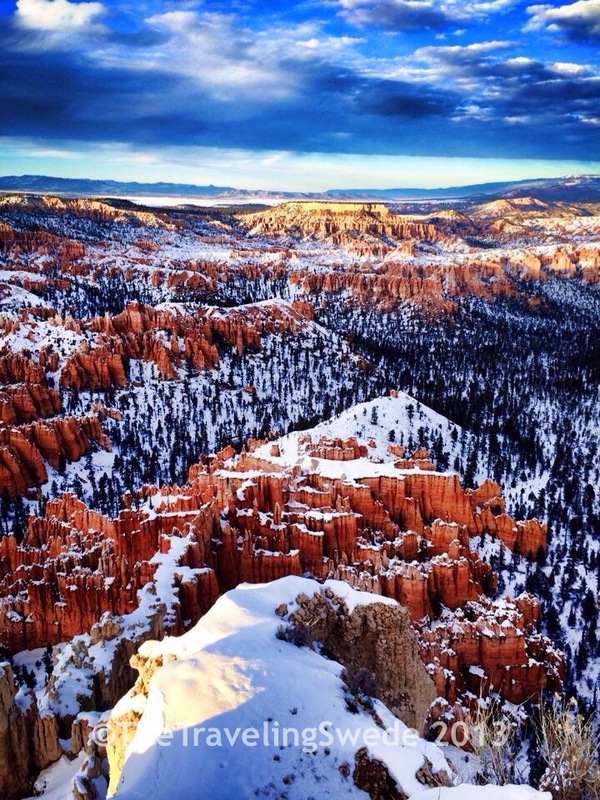 View from the tip of Bryce Point. As I was standing there watching the sun go down I got the feeling that I needed to check another point. So I followed my gut feeling and made it to Sunset Point and well, as you can see on the picture it did not disappoint. 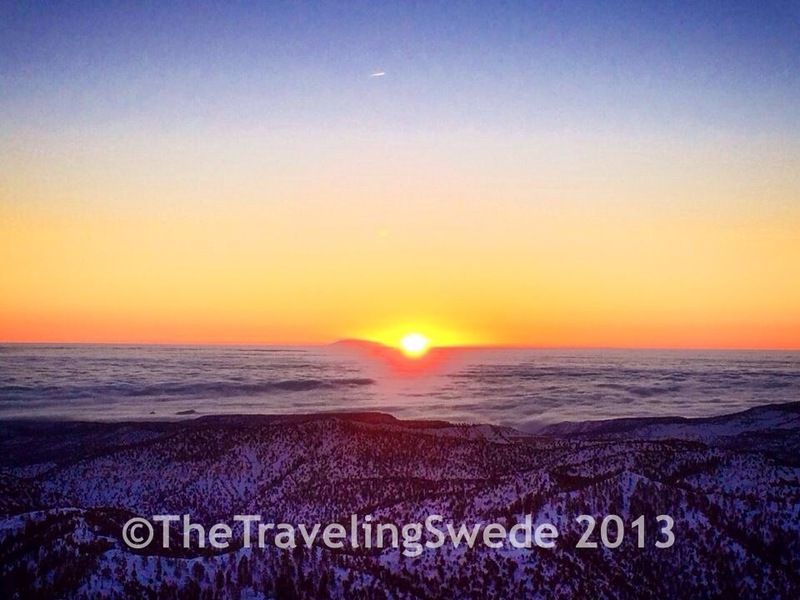 After an amazing sunset it was time to head to Sunset campground, which was the only open campground due to snow. 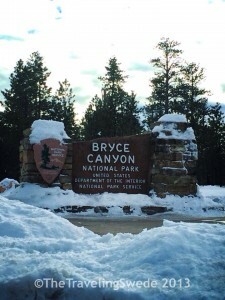 The campground is close to the entrance, the visitor center and has heated bathrooms. 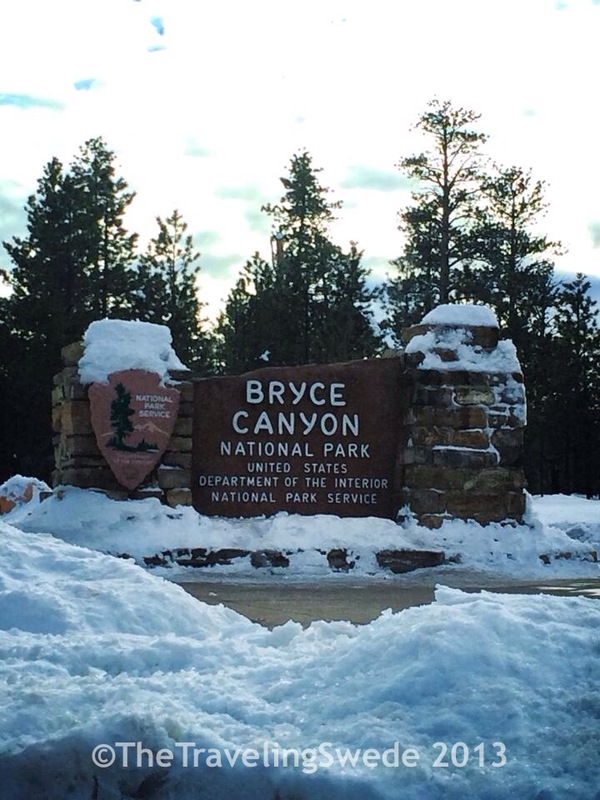 I asked at the visitor center what the overnight temperature was expected to drop to and they said about 6 degrees. 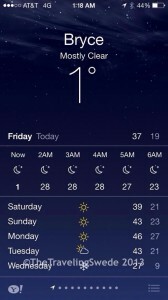 In the middle of the night I woke up and well, it was cold. 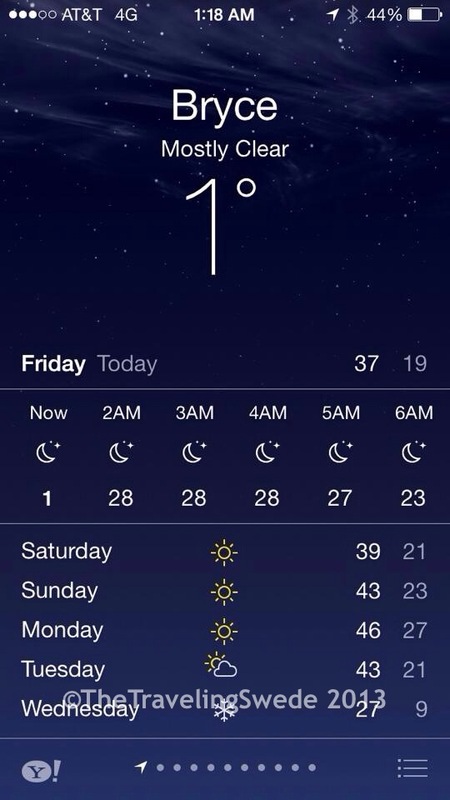 Luckily my Sierra Designs sleeping bag kept me nice and toasty. I absolutely love my new sleeping bag. I have camped out now in freezing temperatures several times and I have never been cold despite that it is only rated to 15 degrees. I got it from Backcountry.com at a great deal. In the morning I had planned to catch the sunrise from one of the upper points in the park which meant about 30 minutes of driving. 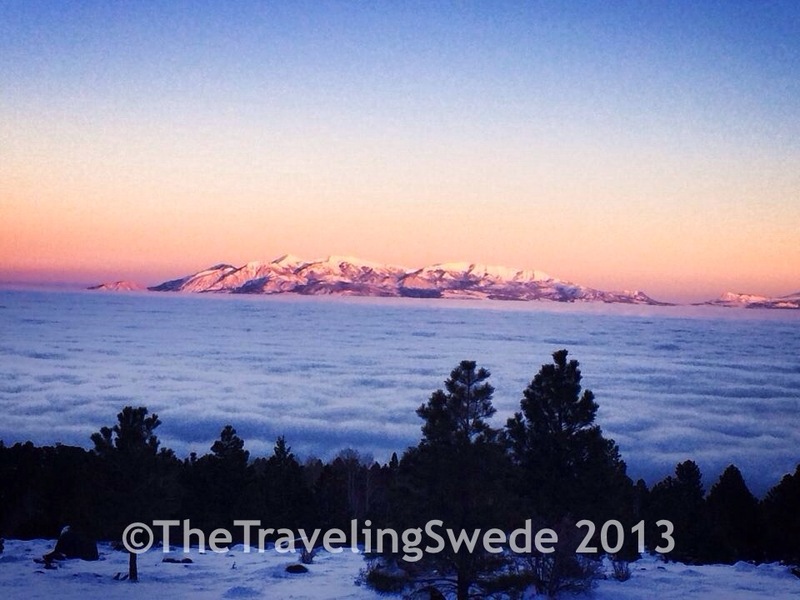 As dark was fading to light I could tell I was above the clouds! No airplane ride needed here. Wow! The pictures are not doing the beauty justice. 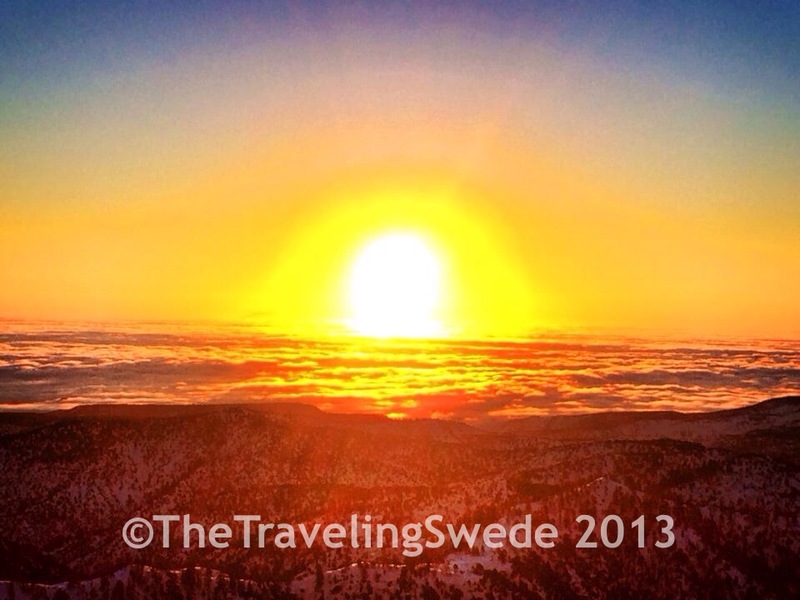 It was almost magical to see the sun rise above the clouds. It pays off to be up early. 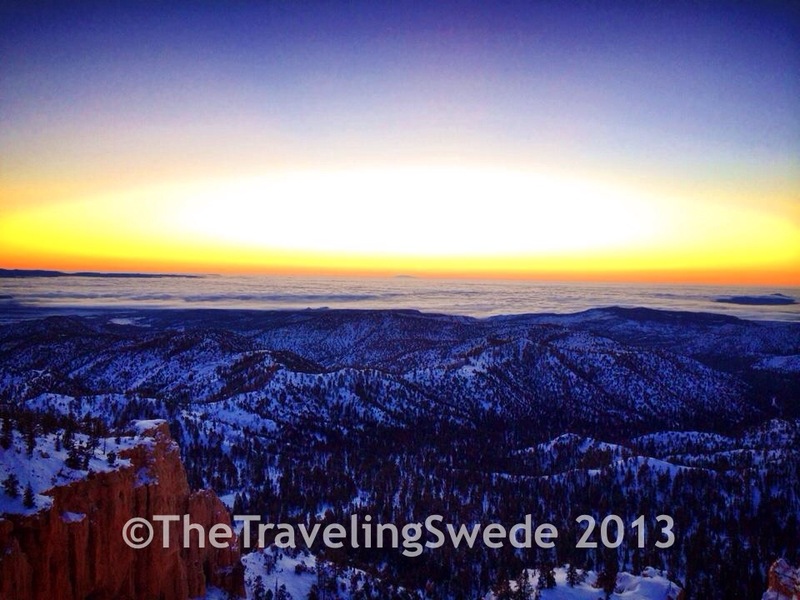 Sunrise, being above the clouds and in Bryce Canyon. Life is good! Once the sun was up I stopped at every view point along the Plateau Rim drive that is the only road in the park and it’s about 18 miles long. The rim is also hikeable and you gain (or lose) 1,200 feet of elevation. 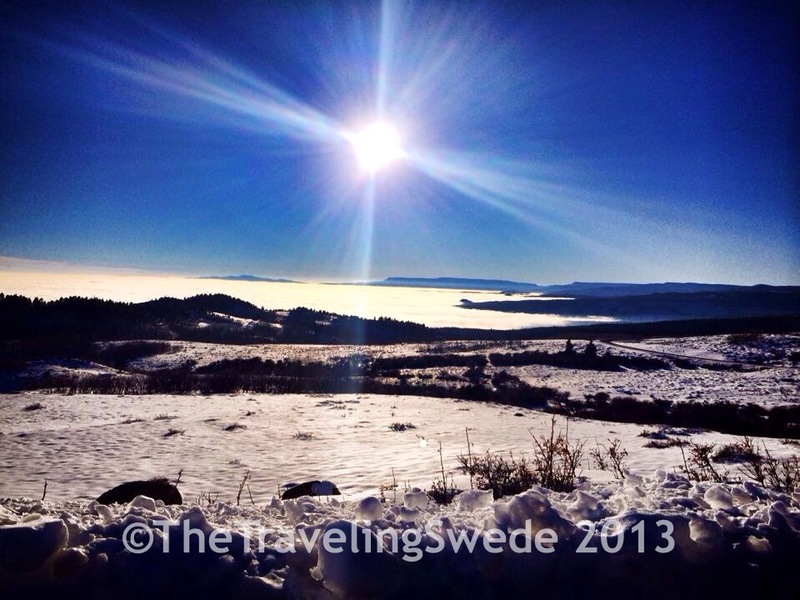 Each viewpoint offers a different view and it’s worth stopping at all of them. Here are a few. 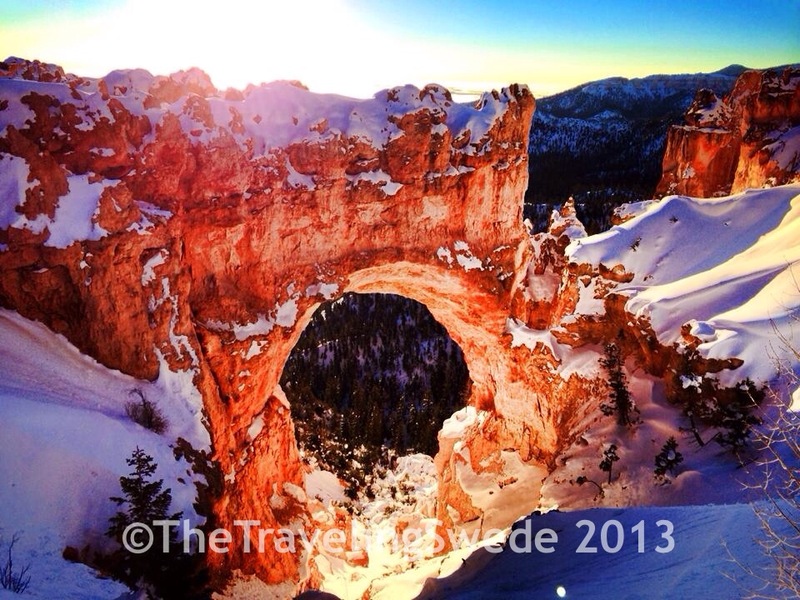 Natural Bridge, elevation 8627 ft.
Hoodoo’s, a pillar of rock, the main characteristics of Bryce. Hoodoo means to cast a spell. There are very few bathrooms along the way so make sure you plan ahead by looking at the map. There are bathrooms at the visitor center and from there only two along the drive. With all the stopping the drive can take you a few hours. During the busy months (April through October) there is a free shuttle. 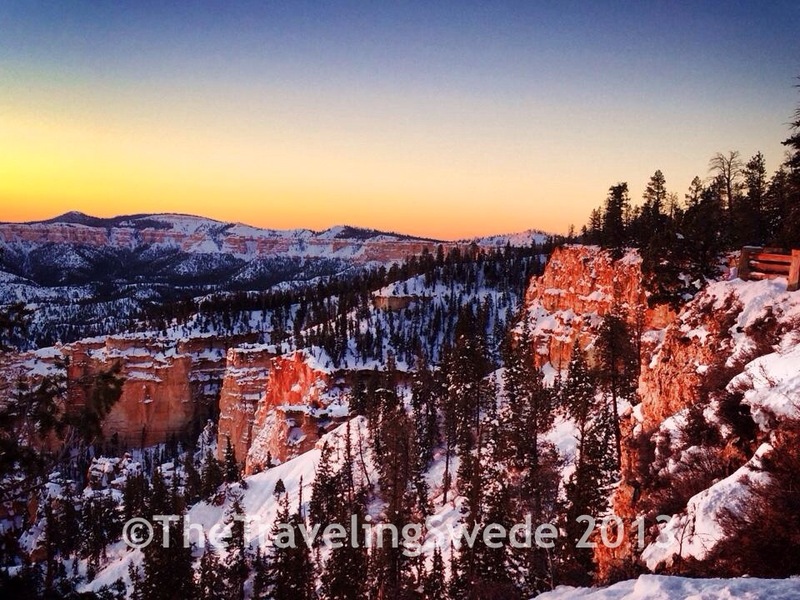 For more information go to the Bryce Canyon National Park site. Just before the entrance to Bryce Canyon National Park there is a general store, lodging, hotel, restaurants, gas station and more. I also had great cell phone coverage for the most part inside the park. Again, it was hard to leave such a beautiful place but I needed to start the drive back home. I love life on the road and before I started driving into the clouds I stopped and had a late lunch while enjoying a grand view. My view while enjoying lunch after leaving Bryce Canyon. The sun is setting over the Henry Mountains surrounded by clouds. There is so much beauty out there and as I was driving into the clouds and fog I carried that with me all the way home. I didn’t get to eat a traditional Thanksgiving dinner but the places I visited blew turkey dinner out of the water. I think I will have to make this my new Thanksgiving tradition instead. Thank you! It’s such a beautiful place to take pictures. I’ll be going back in the spring to hike the rim and take more photos. Just beautiful…and as usual, great tips that I will be referring back to! Thanks! 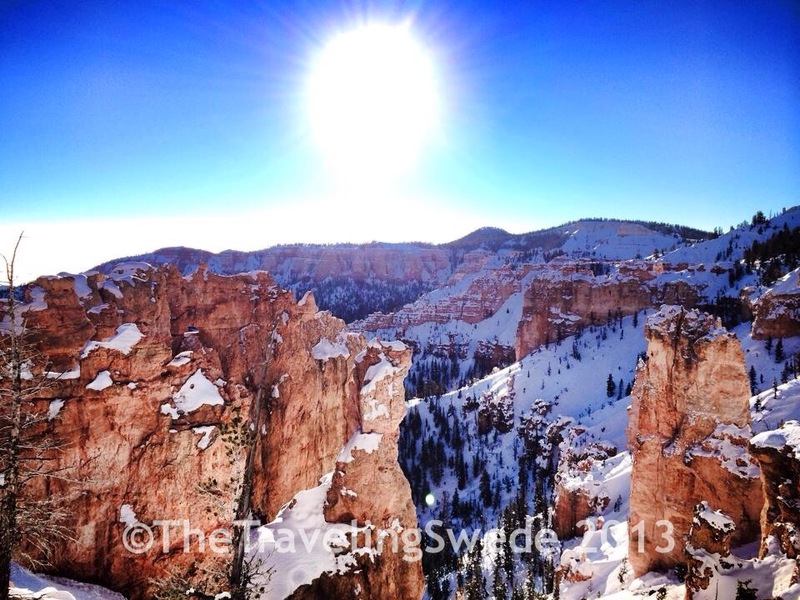 Bryce Canyon is unique and beautiful for sure. And it was great to see so much snow.